We have mentioned before that our favorite thing to do while traveling is try the local cuisine! One of our favorite local dishes we have ever tried (we had it 8 times in 7 days) was khao soi in Chiang Mai, Thailand. 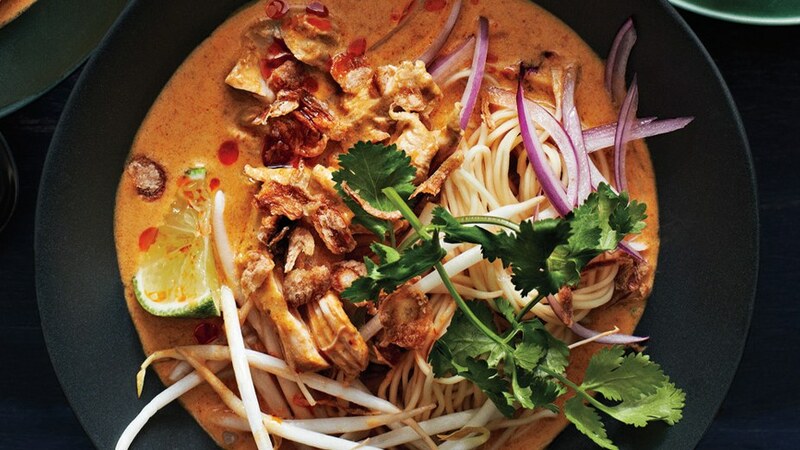 Khao soi is a street dish with a coconut curry soup base, noodles and fried, crunchy noodles on top. It is frequently topped with herbs, chicken and a lime. There are many different variations across the region and countries in the area. We’ve looked around the DC area (where we live) and there are a few places where they serve khao soi - though we know no matter how good the local version is, it is probably never going to live up to eating it in Thailand! We aren’t cooks ourselves, but we did want to share this wonderful recipe for this wonderful dish in case any of you wanted to give it a whirl. Dried chiles are available at Latin markets; Chinese egg noodles and chili oil are available at Asian markets. All can be found at many supermarkets. Place chiles in a small heatproof bowl, add boiling water to cover, and let soak until softened, 25–30 minutes. Drain chiles, reserving soaking liquid. Purée chiles, shallots, garlic, ginger, cilantro stems, coriander, turmeric, curry powder, and 2 Tbsp. soaking liquid in a food processor, adding more soaking liquid by tablespoonfuls, if needed, until smooth. Heat oil in a large heavy pot over medium heat. Add khao soi paste; cook, stirring constantly, until slightly darkened, 4–6 minutes. Add coconut milk and broth. Bring to a boil; add chicken. Reduce heat and simmer until chicken is fork-tender, 20–25 minutes. Transfer chicken to a plate. Let cool slightly; shred meat. Meanwhile, cook noodles according to package directions. Add chicken, 3 Tbsp. fish sauce, and sugar to soup. Season with salt or more fish sauce, if needed. Divide soup and noodles among bowls and serve with toppings.